The machine tool business has many challenges and in many companies there are still opportunities for reducing costs, improving productivity and machine reliability. Machine rebuilders are trusted partners who help customers to bring a high value machine back into optimal working condition even after years of use and millions of parts. 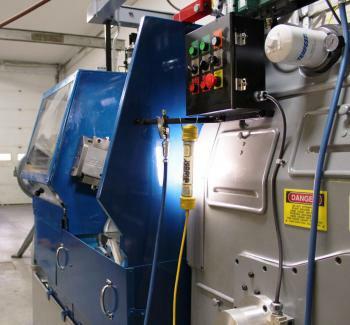 There are different options when selecting a machine rebuilder, especially when rebuilding an Acme-Gridley in the Great Lakes region. In this case the rebuilder is Brett May Engineering also known as BME. BME is better known for their attachments and tooling but they are also an excellent option for an Acme rebuild. 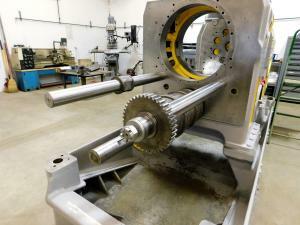 BME offers complete rebuilding services for Acme-Gridley multi-spindle bar automatics. Along with rebuilding the base machine, they also offer a complete turn-key tooled machine to fit the customer’s needs. BME understands the benefit of the Logan Clutch Hi-Lo Retrokit and CS2001 control. They know that the Logan kit will reduce the cycle time of the part and that the machine will be more reliable using Logan pneumatic clutches and brake. The CS2001 control upgrades the electrical system with modern components and a microprocessor with a configureable system that works with an absolute encoder for setting up jobs and running the machine. To keep up with demand, the customer was paying overtime and also used an outside supplier to make parts. Part of the problem is that the machine was run so that they would avoid the risk of breaking the tooling. With the rebuilt machine using a Logan Hi-Lo Retrokit and CS2001 control the cycle time of the part was reduced from 13.5 to 9 seconds, which is a 33% reduction. The customer eliminated the overtime and will soon no longer need parts to be made by an outside supplier. The Logan system eliminates the risk of tool breakage by having a reliable, consistent Hi-Lo brake system. The customer no longer has to adjust the clutches since the Logan air clutches are self-adjusting. Other benefits that the customer pointed out are the tapping failure detection and the machine lock-up detection. There are plans to do other machines. Logan Clutch appreciates the valuable partnership that it has with BME and their ability to integrate our products with their capabilities to help customers to reduce costs and improve productivity. BME offers complete rebuilding services for Acme-Gridley mutli-spindle bar automatics. Along with rebuilding the base machine, we also offer a complete turn-key tooled machine to fit the customer’s needs. Our mission is to supply our customer with all the means necessary to run their job, not just a piece of equipment. This starts from the time of proposal where we provide a detailed proposal to the customer, specifically describing our intended scope of work, minimizing the confusion of what is actually being purchased, and minimizing the need for change orders. It carries on after placement of the order, where bi-weekly Gantt Chart updates and pictures are provided to the customer, along with documented “test” results of the rebuilt machine are shared with the customer. After samples have been submitted and a runoff on BME’s floor is conducted, where we encourage your operators take part in being fully trained on how to operate the machine and adjust the tooling, we duplicate the process on your floor after the machine has shipped. And typically it doesn’t end there, we always pick up the phone to lend our heads in solving a new challenge your staff may have with the project, long after shipment of the equipment. This outlook has allowed us to build very successful relationships with our customers, encouraging repeat projects. If it’s a standard bar machine your looking for, or converting a bar machine to a “chucker” application, please contact us for a quote. We will provide a detailed proposal for your machine, so you will know exactly what you are purchasing, and will not be upsold after the initial order (add link to the contact page). Don’t have an existing machine to rebuild but need one, contact us. Between what we have on our floor currently, and our network of users that do, we can find one to fit your needs.